Three principal stages can be distinguished in studying propionic acid bacteria. At the first stage, methods of their isolation were developed, a considerable number of strains were isolated and identified by their phenotypic and physiological properties. This period started with the discovery of propionic acid bacteria by E. Freudenreich and O. Orla-Jensen in 1906. Cheese, milk and dairy products were the main sources for the isolation of propionibacteria. In the USA, J.M. Sherman (1921) recognized that the poor quality of cheese manufactured from pasteurized milk is due to the loss of some vital microflora. Sherman then isolated a number of strains, including a new one that differed from the earlier isolates by higher acid production during growth in milk or in glycerol media. In 1928, C.B. 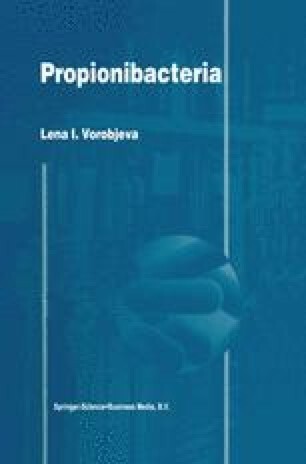 Van Niel published a remarkable work “Propionic Acid Bacteria”(his Ph.D. dissertation), in which a complete characterization of propionic acid bacteria was presented, including morphology, physiology, biochemistry of fermentation and possible practical uses.